Have you ever tried those massage bars that used to be so popular? Jeff bought me one for Valentine's Day many years ago and I really wanted to like it (especially considering how expensive it was). But getting it warm enough to melt was too much effort. 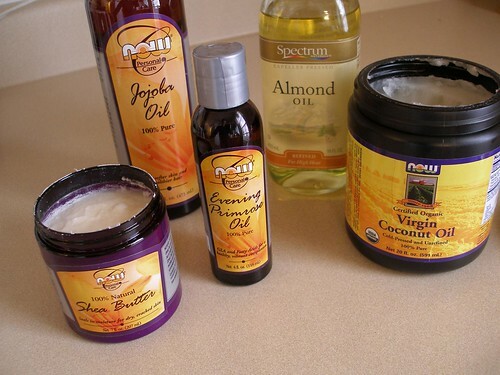 I really prefer oil for massages, but it does tend to make a mess just getting it from the bottle to your skin. Lotion seems to evaporate and make you cold. I've tried using pure mango and shea butter, but their texture always seemed to be a bit gritty. What I really wanted was Whipped Shea Butter, but the price was just silly expensive for the amount that you get. So, encouraged by my rousing success making homemade deodorant, I figured I'd make my own whipped body butter for massages. This stuff feels so nice and silky, melts at body temperature and you can scoop up a decent handful without it spilling all over the place. Originally, I'd planned to share this recipe for all the men out there to make for their partners as the awesomest Valentine's Day present ever. Well, that and a full body massage, that is. As I mixed up a batch, however, I quickly realized that very few men would actually bother making this. It's an incredibly simple recipe, but does take quite some time (like almost all day; though don't worry, most of that time is waiting around). But, I'm sure someone will want to make it as a present, or even just for themselves, so here it is. -In a microwave-safe bowl, melt the shea or mango butter in the microwave. If using shea, it doesn't need to be completely clear and liquefied, but should be free from any gritty bits. If I remember correctly, the mango butter did need to be completely melted before the gritty bits were gone (If you rub the oil between your fingers, it should feel completely smooth.) This took about 30 seconds or so. 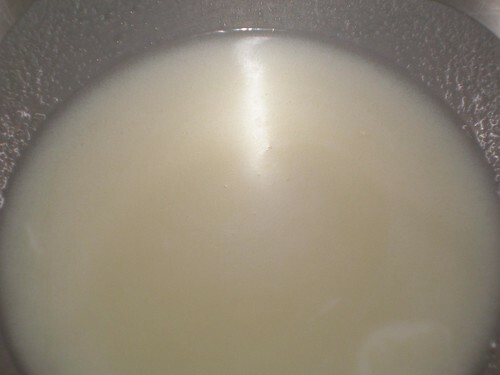 -Pour this in a bowl of a standing mixer. -Mix until it's completely smooth. -At this point the mixture will be close to room temperature, but still liquid. It won't cool any further, but it will thicken over the course of many hours. -Now you will walk away from it for a couple of hours. Come back every now and then to turn the machine on for about 10 seconds, just to keep it evenly mixed. -Eventually it will thicken and will start to look like this, which is close, but not there yet. 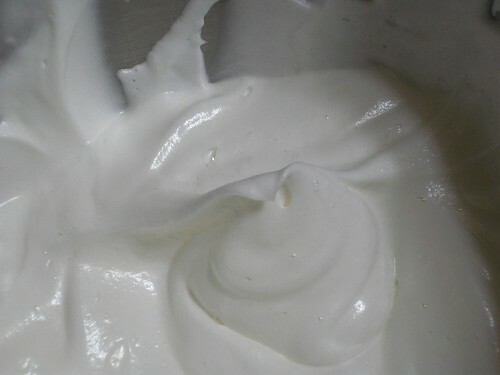 -After a total of 6 hours or so, it should be solid enough to whip for 3 to 5 minutes into a nice whipped cream consistency. It should form soft peaks and lighten in color, almost to white. -Now, you can add any of the oils if you choose. With the machine running, drizzle in the almond, jojoba or evening primrose oil by the tablespooon. Don't add more than an ounce of this or it'll make the mix too soft. Poke a hole in the Vitamin E capsules with a pin and squeeze into the mix. Add the aloe if you want. Finally, add the essential oils a couple drops at a time until you're happy with the results. -When this melts, it's basically oil, not lotion. So don't expect it to have the same absorbency as hand cream. 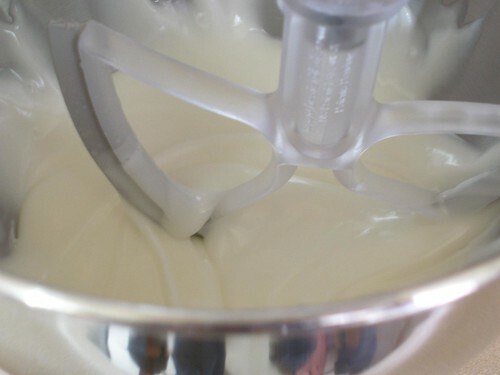 -I've only made this using a standing mixer, but I'm sure a regular mixer would work too. It'll just take longer to whip it up. -If you want to save yourself a ton of bowl scraping when using the paddle attachment on your stand mixer, I highly recommend buying yourself a Beater Blade like you see in the pictures above. It has rubber edges that actually do a pretty fantastic job of scraping down the bowl as it spins. -I have not tried the Raw Unrefined Shea Butter but it looks like, even with shipping, it's a pretty good deal (about 7 bucks a pound). -Don't let the container of this stuff melt (above 80 degrees) or it will go back to the original crumbly texture when it returns to room temperature. -If you've got a lot of nerve, you can give a batch as a very self-serving Valentine's present. The last time Jeff gave me a massage with this stuff I asked him how much better it was than oil (that's usually how I phrase questions to him... things like, how fantastic is this dinner? aren't I awesome? and you're the luckiest guy in the world, which isn't really a question, but a fact I like to remind him of every now and again). He said something along the lines of, "Yah, I guess it's less messy." So there you go. Another ringing endorsement from one of my family members about something I've made. Seriously though, this stuff is fantastic. You know I have a pretty poor memory for things from the past, but I distinctly remember a conversation Sandy and I had about your copius use of lotion, and that she was buying the cheapest lotion she could find (before it was the popular thing to do)! By the way, this justs looks yummy enough to eat! Melanie, I figured someone would ask about it. I love that thing. Wander, oh, this stuff is definitely NOT cheaper than the cheap lotion. It is cheaper than whipped shea butter, though. I don't remember using much lotion as a kid, but ever since high school, I've used body oil instead of lotion, first Neutrogena and for the last decade or so, just plain sesame oil. I use this butter when I'm feeling especially dry. Are you trying to win my heart with the Now products?! This does look good enough to eat!! Um, can we eat it? Because, yum! I love your note on top of the jar. Obviously. I'm pretty sure it isn't edible, so you'll want to clean your dishes really well. And label it too. 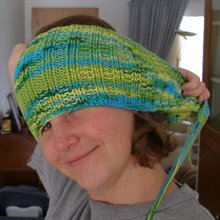 Jenna, I do love NOW products, they seem to have pretty good prices. 6512 and Growing, my daughter was grossed out by the note and told me not to put that picture up. As usual, I ignored her. I knew someone would find it as amusing as I did. It looks pretty deluxe, would it work as a daily moisturizer or would I be in there all day trying to rub the stuff in? Unrefined Shea butter stinks in an undefinable funky way. I would never buy it again! I love the recipe. I want to try it. That's just one more excuse to buy a standing mixer. Finny, I actually use oil as a daily moisturizer, but for some people it might take some getting used to. Basically, after I shower, while my skin is still wet, I massage in a smallish amount of oil (either sesame or this stuff). Then I brush and floss my teeth while the oil soaks in. After about 5 minutes, I towel dry off any excess. Chrissy, thanks so much for the heads up on the unrefined shea. I guess that explains why it was so much cheaper. Any thoughts on an oil OTHER than shea butter that I could whip up like this? Owl Momma, mango butter would work too. Basically, you're going to need something that is a solid at room temperature. For those who don't want to wait hours and hours just pop your mixer bowl into the freezer and check on it every 20 minutes or so. It should be ready to whip in an hour or less. It may diminish the scents of the essential oils though so if you go this route to be safe don't add them until you remove the bowl from the freezer. I've found that when I put it in the freezer, I run the risk of it crystallizing and getting gritty again before I get it all whipped smooth. Though, this is more of an issue when I use the mango butter than the shea butter. 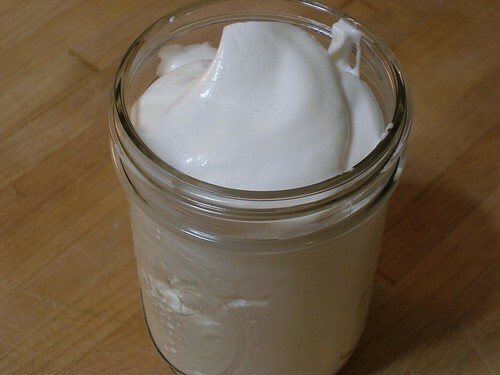 thanks for the fantastic blog on making your own massage cream. ive found a reg mixer works well and putting the cream in the freezer for 5 minute intervals then mixing again is ideal. 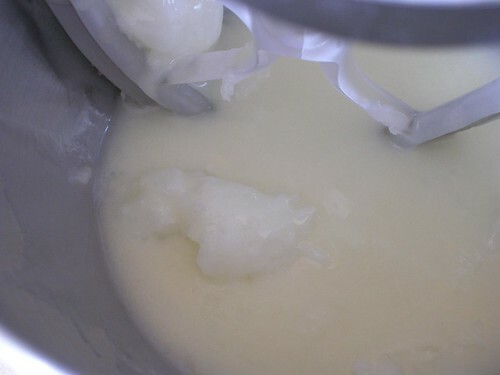 keep putting the mixture in the freezer for 5 minutes then mix again until the consistency is where you want it.